Spend two weeks exploring New England on this summer adventure camp, from the lakes and mountains of New Hampshire to the bike paths and beaches on Martha's Vineyard. Swim in Lake Sunapee and hike Mount Monadnock (and enjoy a six-state view from the top). Explore Edgartown, swim at South Beach and sea kayak quiet bays on the Vineyard. End the trip on a high note with rafting on the Deerfield River. 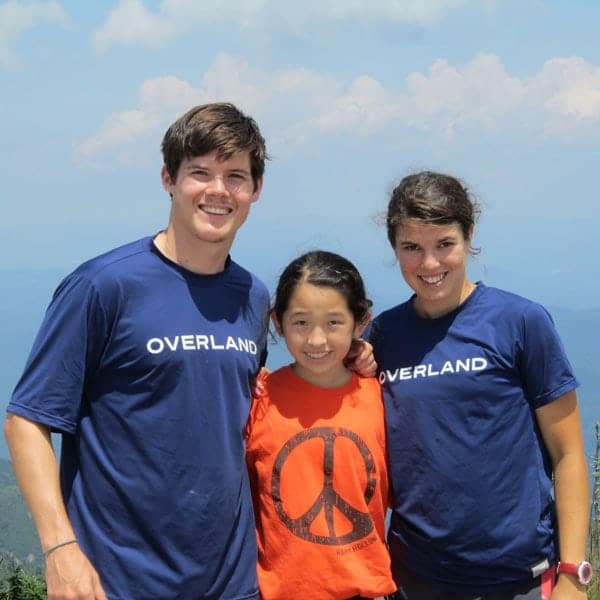 This summer, join Overland for two weeks of mountain and wilderness adventures in New Hampshire, plus beaches and bike rides on Martha's Vineyard! Two weeks packed with friendship and fun. Our trip begins in Williamstown, Massachusetts, with a short afternoon hike to stretch our legs and get to know each other. Then we’ll travel to New Hampshire’s Lake Sunapee region for hiking, swimming and camping. Our challenge hike up Mount Monadnock offers a rewarding six-state view from the summit. We’ll head south to Martha’s Vineyard where we’ll bike around the island on bike paths, visit bustling Vineyard Haven and classic Edgartown and enjoy picnic lunches and afternoons at the beach. A highlight of our time on the Vineyard will be an afternoon exploring by sea kayak as we paddle quiet bays and coves. On our last day together, we’ll enjoy a day of rafting on the Deerfield River and then return to Williamstown for a final celebratory dinner where we’ll look back on two weeks of adventure and accomplishment, friendship and fun. 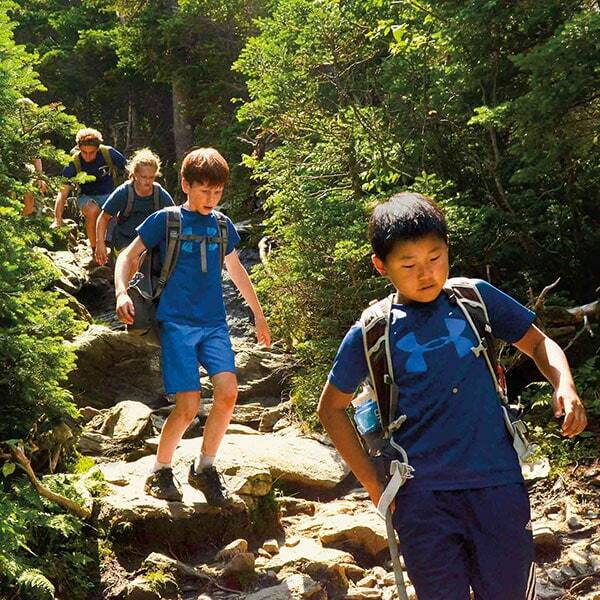 Mountains & Sea Adventure is a wonderful introduction to exploration and adventure in a supportive, wholesome environment, capably led by caring Overland leaders, with activities carefully calibrated to the interests and abilities of 4th, 5th and 6th graders. My leaders were so great! Our trip starts in Williamstown, Massachusetts. We’ll spend our first afternoon getting to know one another, playing games and going on a short hike to prepare for our two weeks together. We’ll drive to New Hampshire’s Lake Sunapee region where we’ll hike, swim and camp. In the mornings, we’ll hike and explore the countryside. In the afternoons, we’ll swim in beautiful Lake Sunapee, play games and make new friends. After a few day hikes, we’ll be ready to tackle Mount Monadnock (3,165 feet). We’ll eat lunch at the summit and enjoy the rewarding six-state, 360-degree view of New England. We’ll take a break from the trail and drive to Cape Cod. From Woods Hole, Massachusetts, we will take the ferry to Martha’s Vineyard. On the Vineyard, we’ll ride along the bike paths across rolling terrain to classic seaports, charming towns and long stretches of white sand. As we ride, we will make time to swim, play games and explore bustling Vineyard Haven and Edgartown. For a change of pace, we’ll take a day to enjoy the island’s coast by sea kayak. Professional guides will teach us the basics of kayaking as we paddle through sheltered coves and inlets. We’ll drive back to Williamstown for a whitewater rafting adventure on the Deerfield River with professional outfitters. The Zoar Gap, a spectacular section of the Deerfield River, is a great balance of fun rapids (class II and III) and calmer water. Back in Williamstown, we’ll spend our last night celebrating two weeks of fun, accomplishment, discovery and new friendships. 8 nights of frontcountry camping. Campground facilities will vary and may include flush toilets, hot water, showers and/or laundry. 4 nights in a hostel or cabins on Martha’s Vineyard. If you are flying to trip start, carry your helmet on the plane with you. What is the weather like on Mountains & Sea Adventure? Hike, bike, raft and kayak from the mountains of New Hampshire to the beaches of Martha’s Vineyard.